Microvita theory finds itself in the somewhat unique position of benefiting from an aura of general interest, scientific relevance and momentum, imparted by its preceptor, the Indian philosopher, spiritualist and social revolutionary Shrii P.R. Sarkar (a.k.a. Shrii Shrii Ananadamurti), while at the same time bearing on a still very early, if not embryonic stage of discovery. Albert Einstein once said “If A is a success in life, then A equals x plus y plus z. Work is x; y is play; and z is keeping your mouth shut” (Einstein). In the early days of modern physics, around the early part of the 20th century, if similarly revolutionary concepts would have made public equally prematurely, to favour one context or another, without worked out theories and tested concepts to lend them authority, we might still live in a world of Newtonian mechanics, without computers, satellite navigation, internet, MRI scans or the Hubble space telescope. Likewise, at this moment in time the avenues for a shared discourse on microvita theory which is at the same time relevant, innovative and not entirely speculative, are limited. Therefore, the choice to publish about microvita here and now should be well considered and genuinely motivated. Recognizing and positively utilizing Sarkars authority is a good start, and also of interest is the presumed relevance of microvita theory in a wide range of disciplines, from physics to bio-psychology, from sociology to cosmology. Whereas an in-depth, subtle physics treatment (the term “meta-physics” may become obsolete..) may be the best if not only relevant approach, P.R. Sarkar himself extensively elaborates on application in these respective fields, and with good reason, because: “otherwise certain problems in modern society may not be solved in a nice way” (Sarkar, 1986). Consequently, publications related to microvita over the past decades were keen to underscore these subjects, mostly in a rather journalistic or pseudo-scientific style. However in this setting, the term “microvitum” was virtually used as a pseudonym for “positive or negative vibration”. Clearly this entails little more than well-intended pseudo-scientific esoterism, obviously inspired by the belief that society is served by giving “microvita” a certain cult status. Slightly more disturbing trends are for example individuals posing as self-declared “official” microvita researchers, or others using microvita theory in a subordinate fashion while its potential is obviously not understood. This sort of complacency, naive esoterism and other outflanking movements should be abandoned for the delicate new concept to reach its full potential within the time frame a globalized society may get in dire need of it. A truly new paradigm brings along its own context. It is not a re-interpretation or re-arrangement of concepts already published before. P.R. Sarkar introduced and elaborated on this new creation theory in such a condensed manner, that his lectures virtually constitute a continuum of key phrases. In the opinion of the author, primus inter pares of key phrases could be his succinct statement: “This is a new line of thought” - followed by the explicit remark that this theory is different than philosophy (Sarkar, 1989-1). Here, Sarkar clearly states that the current subject, “microvita and cosmology”, represents an entirely new paradigm, that is, a new creation theory, one that is centred on life. This was essentially overlooked in a bid for a cognitive quick-fix. The subject of microvita appears to have barely any reference or precedent, certainly not in mainstream science. Hence, insofar the elementary phenomenon of “microvitum” is concerned, this article is written with the notion that the author is as much a lay person as probably most readers. Microvita theory firmly stands on its own and this is especially materialized through the subject of microvita and cosmology, given by Sarkar, so this will be the focus. The potential vastness of the subject calls for some restrain, as contexts as well as backgrounds and implications seem near to endless and can be sooner distractive than explanatory. Therefore, some basic philosophy from the Indian episteme is used, as a minimum assessable context and not for the sake of fundamental explanation. By introducing the new concept of wave matrix physics, including verifiable discoveries by the author himself, it will be demonstrated that microvita theory can be approached in a logical and incisive manner, with an emphasis on physical implementation. The physics implications and examples are necessarily only given in concept here. Readers mostly interested in context instead of content may wish to skip the seemingly technical parts about wave matrix physics and the forces. However without in-depth discussion, study and discourse the subject is sure to linger in trivia as it has essentially done during the 25 years since its inception. 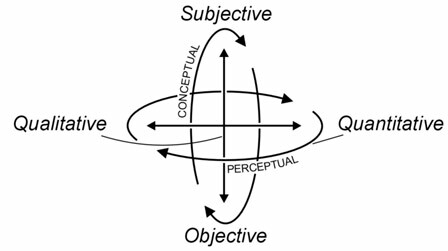 If the actual subject matter is, at least for an appreciable part, taken as an intuitional, rather than a purely analytical challenge, this will greatly favour the accessibility as it is evident and will be proven that the paradigm shift implied by microvita theory will be one toward more heart-centred cognition. Note: many of the graphics in this article are screen captures of 3-D interactive animations. These have been collected in a special online page coming with this article, http://science.trigunamedia.com/mvc-wmp-2011-interactive. From Aboriginal dreamtime creation myths to a hypothized Big Bang, the practical value of a creational paradigm entirely depends on time, place and person. Comparing the proven sustainability of a society based on ancestor worship, with the projected sustainability of our current society based on objectivity worship summons rethinking practicality. As “objectivity” itself is but a concept, all creational paradigms must essentially be conceptual in nature, including physical sciences. This simple truth is profoundly educative, and equally forms the main thread of P.R. Sarkar’s microvita cosmology. Yet, in all traditional approaches, the personal viewpoint appears to play a more or less crucial role, and this can put a limitation on the scientific value. So called “non-dualism” may seem an exception, but its practical value is doubtful for different reasons. Likewise, statements like that of Lao Tze, “the Tao that can be spoken is not the real Tao” are not exceptionally helpful, as it could indicate lack of proper vocabulary just as well as deep mysticism - it is rather mystifying than mystical. Therefore, such kind of philosophies will not be considered. The crux of any creation philosophy or theory is how it can have practical benefit in one form or another, by providing access to the inner workings of a universal creative Entity, which would otherwise remain unknown. Along this line, microvita cosmology will be introduced in comparison with two prominent creation philosophies, “Brahma Cakra” (Cycle of Creation, referred to as BC) and Tantric Theory of Creation (ref. TTC), as given by Sarkar. Some basic physics aspects will be introduced, which can be reviewed in more detail in the external articles. After the main topics on microvita cosmology and wave matrix physics there will be discussions on the origin of microcosm along with the so called long range forces of nature and the physical nature of microvita, in the context of the explained cosmology. The system of “cakra’s”, the subtle controlling centres of bio-psychology, will be reviewed in the light of the new paradigm. Possible practical implications, effects or applications of microvita science in research and society are gradually becoming commonplaces and will not be discussed in any detail here. The use of Sanskrit terms is minimized but not altogether abandoned. Also psychological or psycho-spiritual terms can be used, but, with ultimately the physics frame in mind and only as reference and not for primary explanation. Microvita cosmology will be referred to as MVC. Brahma Cakra (referred to as BC; Shrii Shrii Ánandamúrti, 1961-1) is a cyclic, progressive and somewhat empirical creation philosophy. In short, “universal consciousness” turns itself into matter and vice versa. The progressiveness lies especially in the vice versa phase, that is, the evolution from matter back into consciousness, which makes BC a nice and attractive basic philosophy for the spiritual student. Its scientific value in a physics sense is virtually nought, as the entire approach consists essentially of a more or less coherent selection of mutually referring, mind related concepts with no known physics reality or reference. This makes BC a closed loop approach in multiple ways. A few examples: a mechanism of contraction among atoms to form denser phases of matter is not explained, nor the origin and nature of atoms themselves. Note: this is not necessarily philosophically in error. A bit trickier is the differentiation between material phases (elementary factors) during their creation, respectively when individually perceived. For example, in BC class, the “solid factor” is exemplified as the wood of the table. This is confusing if not right out simplistic, because we know next to nothing of the table or the wood other than through our perception. Concrete explanations do not exist in BC, and even explaining this dilemma alone poses a challenge. This all by all sufficiently undermines the scientific seriousness of BC. But notwithstanding its physics limitations and slightly ominous “don’t-ask-too-much” character, as the progressive spiritual creation philosophy clarified by Sarkar, it is exceptionally rich, charming and mind-expanding. In terms of providing a handle to the inner workings of an unmanifest entity, BC achieves this by the seemingly empirical, but in fact purely conceptual distinction between the issuing- and returning phases. An in-depth analysis of BC with respect to a scientific approach boils down to the true nature of sensory waves, which seems an easy concept in BC and classical physics alike, but turns out to be far from self-evident. BC is to some extend helpful for MVC by providing a general concept of mind however the actual origin and nature of individual mind remains shrouded in vagueness. The Tantric theory of creation (Shrii Shrii Ánandamúrti, 1961-2) provides a universal causal paradigm in the form of a Causal Matrix. Its value and superior elegance lie in replacing the all-day concept of causation, in the form of linear cause-and-result, with a geometric composition of facilitative and attractive principles. This matrix (“progenetrix”) of creative forces is instantaneous, ubiquitous and universal, and its generic stage is referred to as homomorphic evolution. The phase of actual creation, called auto-genesis, is known by the creation of waves, where Sarkar explains that only waves in a setting of gradual change, that is, a flow of similitude, account for the manifest world. The scientific value of TTC is still somewhat uncertain, as it depends on a primary theme of “imbalance” (of the creative forces) which is in truth an auxiliary, personal factor. This is TTC’s equivalent of the dual-phase approach in BC. Further it can be said, whereas BC has a somewhat empirical quality, TTC is highly conceptual. Unlike the cyclic approach of BC, TTC implicates a linear creational projection. TTC is exceptionally helpful for MVC as it provides a worked-out concept of Causal Matrix. It also provides a rudimentary, though universal notion of the creation of microcosm. Wave creation as such is not detailed. The mechanism, so to speak, to gain access to the inner workings of a Universal Entity, or universal medium in the current context, was demonstrated in the case of BC and TTC, with respective benefits and limitations. Subsequently, another principle was introduced by Sarkar (Sarkar, 1989-1), promising a scientific and physics clue to the inner workings of creation. This approach is microvita cosmology. The ultimate achievement of MVC, more than its physics relevance, lies in providing a universal explanation of the creation of unit mind, respectively microcosm. This is not a mere lucky spin-of, it is the crucial proof of scientific relevance as a creational theory. Because if the creation of unit mind is not explained as part and parcel of a universal creational paradigm, or even assumed readily present, the theory is incomplete and at least partially dualistic. Note in this regard, that contemporary physics is likewise incomplete and dualistic, but then, it does not intend to explain mind and much less universal causation, so there is no controversy. Philosophically, MVC could be thought of as structural non-dualism. BC is considered by Sarkar “partially dualistic”. MVC creation will now be explained, including its relation to the Causal Matrix as well as to unit mind and physics. The physics part is realized by introducing a secondary phase of the Causal Matrix, called wave matrix, which serves as a deterministic framework for MVC. To prove the physics part, the manifestation of the long range forces of nature, gravito-inertia and electromagnetism, their respective media and mutual relation will be shown in concept. Astrophysics as well as particle physics may eventually be fully explainable within the new paradigm, but will not be discussed here. When introducing the subject of microvita and cosmology, Sarkar elaborates, in short, about “the direct impact of the inferences (sensory waves) on the [mental] propensities”. This seemingly inconspicuous phrase harbours a universe of implications which was never addressed or even questioned in philosophy or science. Clearly, Sarkar introduces it not in a psychological, but in a creational context. The solution can be revolutionary as it touches the core principle of mind. Normally we consider mind as a mediator, while now mind seems instead to be the actual product of inferences and propensities. This can provide a conceptual breakthrough and a universal new paradigm of mind, provided the universal cause and context of the inferences and propensities are known. This context is the creational diagram of microvita cosmology. "God does not care about our mathematical difficulties. He integrates empirically". Albert Einstein (Einstein). The causal factors in TTC can not by implication be translated into physics, that is, the long range forces of nature, gravito-inertia and electromagnetism. Philosophically, the manifestation of physics requires the mediation not only of Universal Mind, here referred to as universal medium, but particularly also of the microcosm. It will be demonstrated that the role of the latter in MVC is not merely cognitive (e.g. in the sense of association, interpretation, analysis or etc. ), but in several ways structural. To match microvita cosmology with physics, the concept of a wave matrix is introduced. The wave matrix can be considered a secondary stage of the Causal Matrix. Unlike the progenetrix of creation of philosophy, the wave matrix implicates mathematically described, subtle but physical wave discipline. Its correlation with the primary Causal Matrix, that is, the configuration of causal factors in TTC, is assumed to be both ways deterministic. In other words, the wave matrix is only theoretically different from, and could essentially replace the primary matrix. However, the wave matrix allows a qualitative and quantitative description of auto-genesis, which barely exists in TTC and not at all in BC. The wave matrix, that is, the secondary stage or wave state of the Causal Matrix is referred to as WM and its physics as WMP. The waves in WMP are subtle and referred to as causal waves (linked to the causal factors), and it will be shown how they control the formation of normal waves. Verifiable proof of concept in the field of bio-psychology will be given. The following basics of WMP are necessarily a bit technical however for further understanding a somewhat amenable, intuitional approach can be most helpful. The final step involves the geometric manifestation of the respective integration phases in the Causal Matrix. 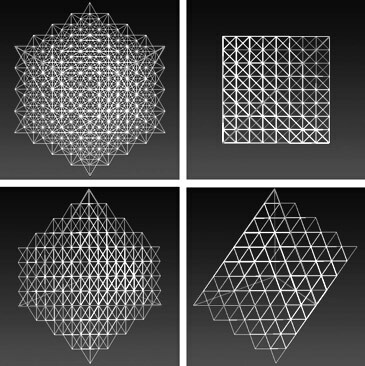 These are realized through the formation of self-sustained geometric singularities. The currently known and proven basic patterns shown here are based on infinite geometric recursion. The 3-D recursive configurations are so called stellations, one icosa-dodeca (centred or spherical stellation) and the other cube-octahedron (distributive stellation). In the formation of these recursive patterns, the “static” matrices are proposed to function as a scaffold for the respective creative, sentient bodies. Specifically, the geometric singularity constituting the knowing principle synthesizes a subjective continuum out of a body of associated vibrations, that is, generic essence, as its common denominator. It therefore establishes a cognitive paradigm of universal subjective association, replacing the classical concept of objective association. In retrospect, it creates a semblance of various, but otherwise unqualified densities in the objective sphere. The result is a subjective continuum, however rather than a vacuum it is a plenum, incorporating various expressed energies. Similarly, the geometric singularity constituting the empathic principle synthesizes a subjective stage of density out of a body of associated energies as its common denominator. It therefore establishes empathy or synergy as an essentially subjective and universal phenomenon, rather than a personal or psychological quality. In retrospect, it creates various, but otherwise unquantified existential planes or continuums in the objective sphere (“Loka’s”, that is, “worlds” in Yogic sciences). The subjective result could be referred to as Cosmic Effulgence. In the context of microvita theory, Sarkar introduced the term Cosmic Factor (P.R. Sarkar, 1986). The term “Actional Principle” obviously refers to the idea of inciting intelligent action, rather than plain energy. The interactions between the Knowing Principle and Actional Principle or equally, between the qualitative and quantitative wave matrix singularities are initially somewhat theoretical, but are highly significant in the formation of Universal Mind. It is verily a diagram of creation in terms of how we empathise with density. The principles of qualitative and quantitative subjective association as the MVC / WMP implementation of the Actional- respectively Knowing Principles, are realized through recurrent frequency ratios inside the icosa-dodeca and cube-octa stellations. Without going into too much technical detail, it can be shown that in the appropriate physical medium (so called heterodyne synthesis), Golden Mean (1.618) ratio recurrence dissolves, through quantitative merger, the vibrational component of waves and thus coheres the qualitative or scalar component. 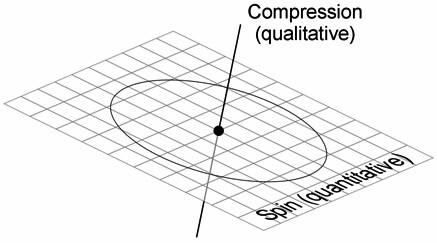 Conversely, octave (2.000) ratio disperses, through quantitative distribution, the qualitative or scalar component, thus cohering the actual vibration. This hints at why these ratios are found prominently in natural creation. The following graph is a numerical simulation of the energy conservation of a recursive wave matrix. Arguably, octave recursion could be considered to indicate a state of minimum coherence, but rather it is a special form of coherence in the context of an external equilibrium. Golden Mean ratio, and subside at octave ratio (numerical analysis by author). This is the final stage of material density, philosophically the point of ultimate crudification, where the Causal Matrix has become maximally bound and encircled by its own creative force and possesses no further creative freedom. From the viewpoint of classical and modern physics, neither electromagnetism, nor gravito-inertia can explain the creation of life and evolution of mind. However, in their generically combined form, the forces of nature remain associated with the geometric singularities, that is verily, with the Causal Matrix and this, in short, is what allows microvita to control evolution. Equally, from a classical point of view, the unsuccessfulness of science to explain life in a complete sense can be reduced to the inefficacy of modern physics to reconcile electromagnetism and gravity. A down to earth hint could be that biological life is created right in the central arena between the atomic and astrophysics forces. But this has not yet led science to realise that life itself could be the solution to unification. This is precisely the approach of MVC / WMP, however evidently not based on objective empiricism (essentially, materialism), but on the Causal Matrix. In the physical plane, there is no difference between the biological body and its material environment. This means that there can be no such classification of microcosm, as the forces of nature are impartial with regard to the elements in one place or another. At the same time, as the universal medium is unqualified, pervasive and essentially unchanging, this alone neither classifies microcosm. In MVC / TGP, the uniqueness of the microcosm lies in the totality of a biological body, a physical environment and the experiencing mind. In other words, neither of the factors alone is completely explanatory. The inter-dependent aggregate is referred to as the individual- or unit matrix and will now be explained. Firstly, Sarkar’s new line of thought, introduced through the impact of the inferences on the propensities and in its worked-out form of MVC / WMC, is applied to the biological body. The secondary or empirical inversion, transforming the universal medium (Universal Mind) into the physical plane is reflected in the glandular and sensory functions, relating physicality to mental propensities and (indirectly) to inferences. The primary or dimensional inversion, from the Causal Matrix into the universal medium, is reflected in the central nervous system or CNS, logically relating to the propensities and inferences on the one hand, and to the subjective and objective faculties on the other hand. This defines the body in terms of its subtle mechanisms as a biological microcosm of the universal process. In undeveloped microcosms, there are no significant sensory and glandular systems and hence these are virtually mindless creatures. Underdeveloped microcosms may have a sensory system and some developed mental propensities, however as the CNS is not fully developed, the primary inversion is not individualized, and the entity has little or no conceptual powers. In such cases, if they have developed into social beings, the species or group as a whole possesses a collective intent guiding them to more security and collective success and welfare. The microcosm’s perceptual powers are the individual’s response to its initial conception by the Universal Mind. Through individual perception the microcosm can define and preserve itself and begin to evolve through synthetic appropriation, that is, individualizing the universal conceptual powers. Slightly philosophically, this equally applies to a single wave, which therefore could be considered the simplest microcosm. Thirdly, the Causal Matrix creates neither atoms and molecules, nor stars and galaxies directly, but encodes the universal qualitative and quantitative faculties which, when conceptually and perceptually correlated, constitute and reciprocate their respective principles and media and this way create the physical world. These three factors body, mind, environment together constitute the individual matrix, that is, the creational paradigm of microcosm in MVC / WMP. The term microcosm adequately reflects a universal approach, as ideally it is a perfect microcosm of the macrocosm, physically, mentally and spiritually. Only, the term macrocosm is not used, as it sounds like astronomy, while macrocosm includes the world of astrophysics as well as the atomic world. The diagram of the individual matrix illustrates the fundamental difference between MCV / WMP and classical philosophy: philosophy presumes a difference between microcosm and macrocosm but can not ultimately explain it. MVC / WMP proves they are essentially the same, and can nevertheless explain the difference. This approach also differentiates microcosm from individual mind. It is thus demonstrated that according to MVC / WMP, the physical world, as well as the body, as well as the experiencing mind each within itself constitute a complete creational paradigm, however need an auxiliary factor for complete explanation. In philosophy, individual mind is generally equalled with the sum total of mental propensities, which is consistent with the approach of MVC / WMP in that it is neither the laws of physics, nor “consciousness” alone which makes a microcosm unique. Now that the creation of the individual matrix is clarified, the long range forces of nature can be explained. A physical principle, either a wave or a force, needs a particular medium in which to express itself. Therefore, every physical expression requires the presence of a physical principle and a physical medium. 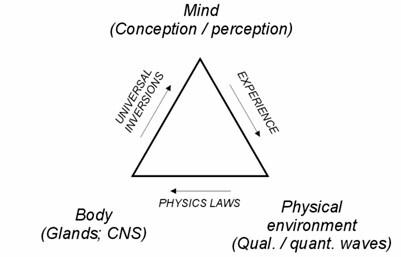 As follows from the diagram of individual experience, a physical experience requires a conceptual and a perceptual dimension. In the case of a wave, the physical principle is perceptive and the medium is conceptual. Conversely, in the case of a force, the physical principle is conceptual and the medium is perceptual. Now, as theoretically the same physical principle can either express itself conceptually as a force or perceptually as a wave, the requirement of physical experience alone cannot explain the difference between the classical forces of nature. This differentiation is established only through the combined expression of waves and forces, along with their respective media. This represents the status quo in natural creation. Logically, it means that the perceptual and conceptual media, instead of being opposite, are progressively reciprocated through their implied physical principles. As far as pure physicality is concerned, the polarized expression of the physical media and principles is irreversible as well as irreconcilable. However, not the physical forces, but the universal subjective and objective faculties ultimately control creation. In other words, natural creation not only employs the physical principles but is also controlled via the respective reduction phases of the universal medium, that means, through microvita and propensities. With respect to the created entity, the physical principles can be identified as gravito-inertia and electromagnetism. The created entity is the known universe, characterized by a daunting chasm between atomic matter and astrophysical scales. It is only the universal sentiency ensuing from the endless reciprocation and reconciliation of the physical media, orchestrated by microvita and propensities, which prevents the existential chasm from becoming infinite. The equilibrium of physical principles and their media is established through a concession by the Causal Matrix during objectivation. A single axis of rotation of the objectifying medium can essentially not observe multiple geometric orientations at the same time. Hence, under the pressure of its own objective projection, the causal matrix’ qualitative and quantitative singularities undergo a certain angular divergence. The imminent loss of internal equipoise creates endless alignments among the matrix entities, vibrating the objectifying medium through its respective reduction phases in various ways. In the secondary reduction phase they control the conversion of the energies of the subjective continuum into universal and individual mental propensities in the objective continuum. At the same time, in the primary phase, these vibrational alignments control the conversion of subjective density or Cosmic Effulgence into generic essence in the arena of objective density. In retrospect, the original factor is then referred to as microvitum. Whereas the continuous flow of wave creation through the instrument of the matrix singularities is essentially uncurbed, as a result of this subjective concession tenuous fractions of those waves are conceptually accelerated. Each wave thus evolved, is not a mere linear vibration, it is a vibrant, living entity, a harmonically reciprocate composition of transversal and longitudinal media, components and causal vibrations. Because through this process the objective bias is to some degree subjectively restrained and hence refined, it can carry a particular idea. This signifies the process of synthetic appropriation in distinct spheres, as it initially applies to individual waves, which thus could be considered a rudimentary form of microcosm. Hence, with respect to the created expression starting with single waves, conceptual acceleration is the process which evolves individual experience and thus life. It proves how in the wake of the objectifying force, as a consequence of its intrinsic geometric ambiguity, the Causal Matrix exerts a particular influence allowing a fractional amount of objectivation within its own regime. This influence is as dramatic as it is subtle, as it constitutes the pervasive intelligence guiding a minute portion of the objectifying force into creating the known universe. The vast majority of waves however accelerates into the plane of ultimate objectivity and remains unaccounted for in terms of normal experience. There, in the nadir of physical manifestation, the universal reduction phases have become utterly trivial and therefore the creational continuum has become indistinguishable from, and has effectively been absorbed in density. This defines and explains the stage of ultimate physicality. Any trace of objective reality in a classical sense, of this stage juxtaposed to the Causal Matrix might appear physically trivial, having uncertain identity and purpose. the icosa-dodeca matrix with respect to the cube-octa matrix. 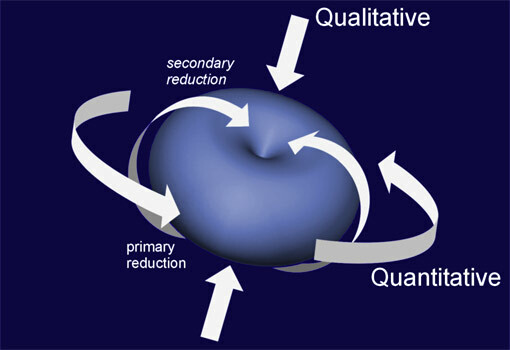 The coherent aggregate of perceptual and conceptual vibrations is represented by the dimensional torus. Its rotational and toroidal resonances form a rudimental representation of equilibrium brought about as a secondary instance of the Causal Matrix. The torus therefore contextualizes as well as explains the physical principles and media. Now, “force” is a name for an accelerative effect in its natural medium. The same is true for a force field. Therefore, in MVC / WMP, as it is based on universal causation, the concepts of forces and force fields are abandoned. These terms may be used as a reference, but always refer to spherical or rotational accelerative effects in natural creation. The dimensional torus incorporates both forms of acceleration in one body, representing the physics of controlled dimensional expression. As it was established that the torus represents equilibrium of perceptual and conceptual vibrations in natural creation, the classical principles of gravito-inertia and electromagnetism should be distinguishable. The longitudinal adjustments produced in the wake of objectivation, constitute the conceptual medium in which perceptual waves can propagate. These waves are light, that is, electromagnetic vibrations moving in one particular direction through the conceived medium of space. Conversely, one might argue that the longitudinal vibrations are thus gravito-inertial. However there is no natural argument for that. Instead, Yogic science can be more helpful at this point with the concept of sounds of creation. These are conceptual vibrations, because sound is intrinsically conceptual, rather than because these frequencies fall outside the common auditory range. In other words, although biologically sound is a perception, its significance is conceptual. The medium in which the sound waves of creation express themselves is perceptual, as they move in all directions in perceived time. Hence, as sound is a conceived vibration in a perceptual medium and light is a perceived vibration in a conceptual medium, in natural creation the physical media are progressively reciprocated through their imminent physical principles. So, if the physical creative principles are to be appreciated in a universal style, the generic medium should not be confused with the natural medium A physical principle analyzed in its generic instead of its natural medium, does not express in the form of a wave, but as a force. Hence, the Yogic sound of creation perceived in the medium of normal space is a force, and that is the force of gravity. Likewise, electromagnetism analyzed in a laboratory condition, that is, relation to physical particles is known as a force. The forces are represented as centrifugal and centripetal principles in the dimensional torus. The torus, having a topological shape but no topological features, represents physical rotation mathematically in the form of a continuous accelerative flow. Hence, with regard to the combined accelerations, the torus constitutes a coherent geodesic topology. This should not be confused with the geodesic paths related to geometry. As in natural creation the physical principles and their media are reciprocated to form the conceptual and perceptive arrows of physical experience, physical reality is obtained by resolving the rotational spin of the torus in time, and the toroidal spin in space. This relates gravity and electro-magnetism in a meaningful, creational way. It is what the biological body does to maintain its integrity among the natural elements and hence it is the reason why all biological organisms have some form of unconscious or conscious experience. 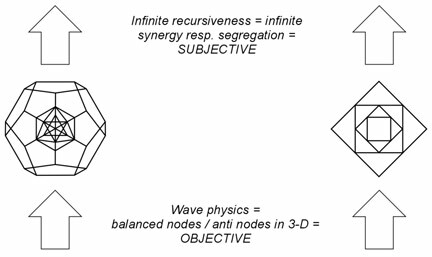 The emerging of the long range forces of nature has thus been clarified within the causal paradigm of MVC / WMP, by demonstrating how the secondary influence of the Causal Matrix in the wake of the objectifying forces creates coherent longitudinal vibrations, together with the transversal primary waves creating the reciprocal diagram of perceptual and conceptual media and physical principles. Whereas Brahma Cakra was shown to be intrinsically progressive, that is, evolutionary, while the Tantric theory of creation implicates a linear creational projection, microvita cosmology constitutes neither style explicitly, or equally, incorporates both. This means that, at least philosophically, the theory implies an evolutionary principle, although it may not explicitly be based on it. Now, the projection of the vibrations from the Causal Matrix onto the plane of physicality is not only orchestrated by the Universal Mind, but also coloured by the unit mind, that is rather, the microcosm. As a result, while the long range forces of nature are united in principle, they are separated in fact, and this is what creates the physical universe we live in. It was further demonstrated that in the microcosmic matrix, each component of a microcosm within itself reflects a complete creational paradigm, albeit not fully explainable in isolation. Also the inner structure of each component was explained. This together defines the practical scope and stages of evolutionary forces in MVC. The balance of centripetal and centrifugal principles throughout creation, that is, within each of the stages of the universal medium, is ultimately encoded as causal bifurcations issuing from the Causal Matrix. This is equally true for the pure mind, the biological body and the physical environment. Nevertheless each component of the individual matrix is controlled via its own respective media. These vibrational matrices are the generic keys in the various universal strata of creation, referred to as microvita. The evolution of the biological body is expressed through the development of the glandular centres and its senso-motoric auxiliaries as well as the CNS. Whereas the biological body is composed out of the physical elements, its growth and evolution are controlled by bio-chemistry, and the generic key of bio-chemistry is dna. Dna is not typically categorized as microvitum, however according to P.R. Sarkar, the proper name for a virus should be “microvitum” (Sarkar, 1987-2). A virus is a mobile package of dna, and its medium for expression is biochemistry. The scientific idea that viruses may have had, and still have a pivotal role in steering evolution is reminiscent of microvita theory in the field of biochemistry. Following this line of thought, viruses are thus identified as a type of microvita which can be seen through a powerful microscope. The discovery of Golden Mean tuned distribution of codons in the human genome hints at a level of organisation of genes currently unexplained by genetics and evolution (Perez, 2010). The physical environment of a microcosm is its biotope, rather than a collection of physical elements. In this setting, a distinction between atomic matter, ecosystem and astrophysics is of secondary importance, rather it is the unified long range forces of physics (gravito-inertia and electromagnetism) which evolve and control the biotope throughout the spheres. This unification of forces is neither explained with classical physics, nor with quantum physics and relativity. The concept of generic keys, that is, microvita in biotopes is centred on the expanded MVC / WMP concept of waves. The common physics concept of a wave is only of quantitative nature, that is, a function of its propagation in time and space. 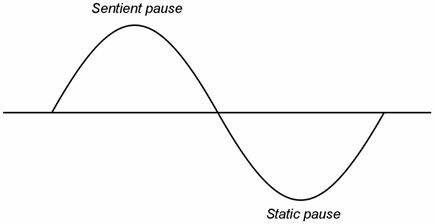 According to MVC / WMP, waves also have an intrinsic qualitative scheme, and hence all waves function essentially also as inferences. It is the qualitative aspect of waves, which causes the known universe to be not only a place hospitable for life, but actually a living entity itself. Other than in the case of the biological body or the individual mind, the creation and purpose of the universe as a biotope reflects microvita cosmology directly, in that creative waves are completely defined by the combined reduction- vs. integration phases among the universal subjective and objective faculties. The characteristic inversion phases in the universal medium are therefore implied, rather than explicated. That is, the primary or dimensional inversion is expressed in the differentiation between the qualitative and the quantitative, whereas the secondary or empirical inversion lies in the separation of the subjective and objective faculties. A concept of generic keys in the universal creation of biotopes is still barely existent in contemporary physics, especially as there is no idea of the subjective stage of density (universal actional principle or cosmic effulgence). A rudimental notion of objective continuum (primary objective faculty) could possibly exist in the form of what is referred to as “black matter” which can be interpreted as the vacuum, that is, plenum, itself creating interstellar, galactic and intergalactic gravito-inertial fields anticipating the emerging of visible structures. This supports a continuous creation model, as opposed to the Big Bang theory currently in vogue. 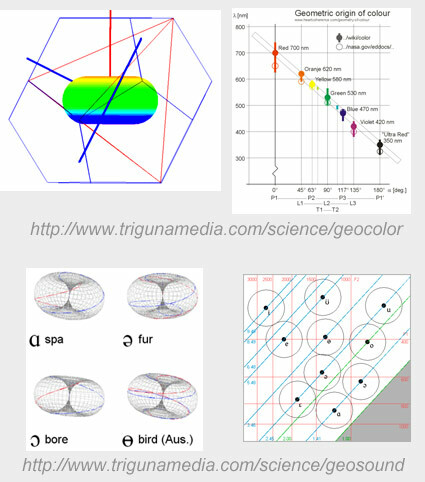 Following MVC / WMP, the generic keys accounting for universal evolution and biotope creation are to be identified as geometric singularities in various forms. These generic keys or microvita cannot be seen through a microscope or a telescope, but can be inferred through their effects within the physical plane, that is, the formation of a living universe and ecosystems. The evolution of individual mind is characterized by the developing of individual perceptive and conceptual powers, which together account for universal modes of experience, or empirical archetypes. One might argue that the generic keys in this plane belong to the realm of conceptuality, but better is to classify them in the realm of pure idea. Hence, the structuring of the mind’s conceptual and perceptive powers is neither caused by viruses resp. dna, nor by matrix singularities, but is controlled by the primary causal plane, that is verily, the Causal Matrix. It could be argued that in the phase of homomorphic evolution there is no specialisation whatsoever, hence we should identify the plane of pure idea as the earliest stage of auto-genesis, that is, until the formation of waves, resp. a flow of similitude. In terms of wave matrix physics, it is a stage of initial geometric formation, however anticipating the creation of singularities. In terms of the operative principle, it might just about touch the primary dimensional inversion, but not anywhere beyond that, because that would imply the formation of universal mind. In order to discern the generic keys on the level of pure idea, P.R. Sarkar clarifies that they can only be conceived, in a semi-perceptual form, through deep intuitional practice (Sarkar, 1986). However regarding “idea”, there exists a very valuable clue in philosophy: “Every vibration in this universe has colour and sound. Every vibration also represents a particular idea, and hence each idea has a vibrational sound and vibrational colour. By applying WMP in the early stage of geometric formation, that is, the onset of autogenesis, to the generic principle of colour and sound (not to confuse with the classical, quantitative explanation), the author has found compelling, verifiable and falsifiable evidence of a generic structure of human perception and conception. This is, respectively “the geometric origin of selective colour empathy” (Bovenkamp, 2006) and “the geometric origin of selective sound perception” (Bovenkamp, 2010). More than providing proof of concept of generic keys in individual experience, these discoveries make a strong case for the MVC / WMP paradigm as a whole, as it presents a case of empiricism not merely referring to the objective world, but also including intrinsic subjectivity. A nice philosophical side note is, that the influence of generic keys in the mind blends the concepts of creation and experience, or from a slightly different angle, implicates that each experience entails a micro-evolution within itself. wave matrix physics in biopsychology. Now that the concept of microvita, applied to the components and stages of microcosmic and universal creation has been explained, a remaining issue is what could be phrased as the wave / particle duality of microvita theory. Microvita were proposed by Sarkar as fundamental particles, that is, without interior structure. In the case of viruses this seems a bit ambiguous, however it may hint at a certain archetypal quality of a virus (resp. dna), e.g. in the form of a more complex geometric singularity. This then ought to be fully mirrored, rather than merely created or implied, within its molecular structure. This approach is somewhat akin to a quantum wave function of a complex molecule. From a physics point of view, a wave matrix entity comprises a combined electro-magnetic and a gravitational wave vector. The Dirac equation (Gibson, 2011) mathematically combines the non-linear wave equation of quantum physics, with the formulation of general relativity. It has many proven applications, but a major challenge remains to develop a physical interpretation of certain factors in the equation. Here in fact, MVC / WMP could be tremendously helpful, as in fact it proposes physics regimes which have not yet been fully disclosed or even suspected. The subject of the cakras (psycho-physical controlling centres or plexi; Sarkar, 1989-2) would naturally be part of the discussion on microvita and the human body with respect to the glands. However the application of MVC / WMP to the cakras deserves a special place as it is found to generate the complete design of bio-psychology known in Yogic sciences, including the number of mental propensities in each cakra. As discussed before, in the universal scheme the evolution of glands relates to the secondary or empirical inversion, linking mental propensities to physicality. The subtle controlling centres of the glands are called cakras, or plexi. The synchronization of propensities with sensor- and motor organs is not the role of the cakras, but of the CNS. The phase of creation just before the secondary or empirical inversion in the universal medium is controlled by the qualitative and quantitative matrix singularities. In the diagram of MVC / WMP, these matrices are found to imply the complete system of 5 basic cakras, the channels connecting them, as well as the type of propensities in each chakra. The expressions of the Causal Matrix in that stage include the 2 creational flows (evolution vs. withdrawal) and the two subtle physiological flows (activation vs. inhibition). In bio-psychology, the two creational flows correspond with the seat of the mind, the 6th or Ajna cakra. The physiological flows correspond to the subtle energy channels (the “nadi”, respectively “Ida” and “Pingala”). These 2 x 2 combinations each control the four basic wave matrix geometries comprising the qualitative and quantitative chambers of the universal mind. This combined constitutes the 16 (2 x 2 x 4) propensities of the fifth cakra, the sidereal plexus. The causal flows associated with the four basic matrices are reflected in the individual terminus as four wave nodes. This forms the first or terrainian plexus. The same causal flows terminate as antinodes in, or just beyond the fifth cakra. 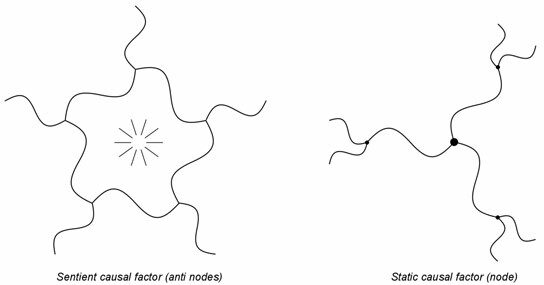 The causal flow meandering through the five plexi can thus be counted as 3 whole cycles (in between four nodes) plus half a cycle (from the fourth node to the anti-node terminus). This wave number is reflected in the 3 ½ windings of the fabled “coiled serpentine” of the terrainian plexus known in yogic bio-psychology, where the sum total expressed creative potential lies quiescent, rather than dormant. The 6 cardinal orientations of the quantitative matrix (shown here in rudimental form) constitute the 6 propensities of the 2nd or fluidal plexus. This is the bio-psychological centre of individuation. The 12 cardinal orientations of the qualitative matrix form the 12 propensities of the 4th or solar plexus. This is the centre of empathy. This so far captures almost the complete MVC / WMP creation diagram, except the two reduction phases. In the MVC / WMP diagram and in the system of plexi alike, these are balanced in the centre, that is, the 3rd or igneous plexus. It’s somewhat less obvious 10 orientations are the result of 10 different interdigitation angles between the principal regular polyhedrons of the qualitative and quantitative singularities. 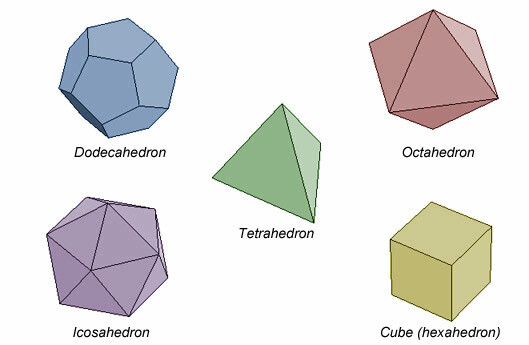 These are derived from the discrete orientations of a tetrahedron inside a dodecahedron. This was proven by the author to predict the exact wavelengths of 9 primary colours as well as the retinal peak sensitivity, and logically corresponds with the 10 mental propensities in the 3rd plexus, which indeed is associated with light and vision. This way, the map of 5 basic cakras along with their proper number of propensities and network is explained from the viewpoint of MVC / WMP. In the diagram, the propensities are illustrated using the complete combined geometric singularities, for each plexus 3-D oriented to emphasise the geometric function in that plexus. 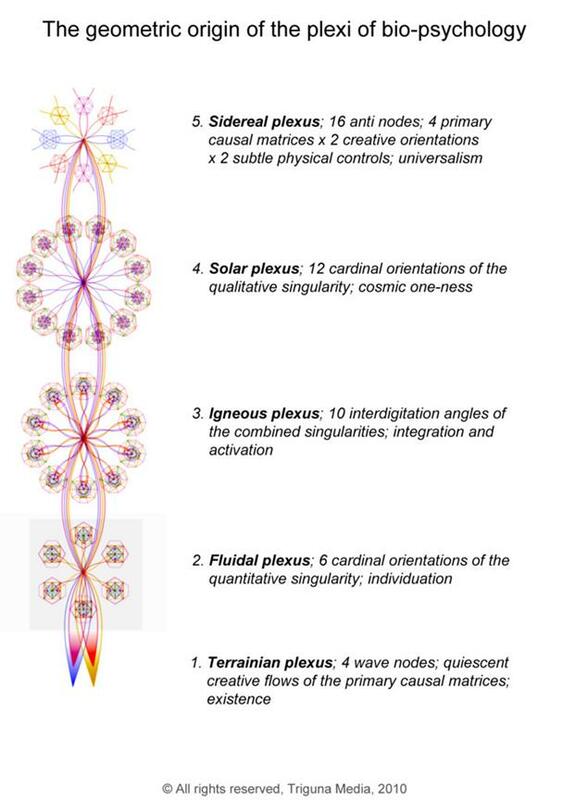 The 2 main channels are cycling through the centres, their interior 4 flows converge into four wave nodes in the base plexus while opening up to the Causal Matrix as 16 antinodes in the sidereal plexus. The second inversion of the universal medium implies going out of dimensions again, that is, into the realm of physical experience. This is explained as follows. In the pure instance of experience, the mind is fully identified with its object. In philosophy, this is called “citta”, meaning “mind-stuff”, also referred to as “done-I”. Only through subsequent subjectivation, the primary perception is placed into the realm of time, place and person, that is, dimensions. This is where the microcosm experiences contexts and events. This stage is called “aham”, meaning “doer-principle” or “doer-I”. So, the “citta” is the object of the “aham”. The subsequent stage of subjectivation integrates the personal factors, which makes the mind aware of its intrinsic nature, purpose, values and meaning. This is “mahat”, that is, pure “I-feeling” or “I am”. 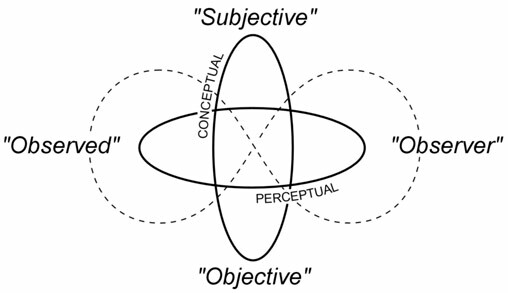 Thus, the three stages of mind in philosophy have a certain descriptive parallel with the universal phases in MVC / WMP, however they cannot clarify the cause and inner logic. Hence, as said before, philosophy is used as a congenial context only, and not for explanation. With respect to physics, the idea of continuous creation has consequences not only for relativity but also for quantum physics. Relativity theory generalizes the Newtonian concept of gravity, however fails to provide a causal explanation as it assumes existing matter, created in a hypothetical Big Bang. Likewise, quantum physics is inconclusive as it assumes an existing “observer” as part and parcel of materialization, but fails to explain or even merely question its origin and nature. MVC / WMP, rather than claiming to have final answers, may help formulate the proper questions with regard to a unification theory. 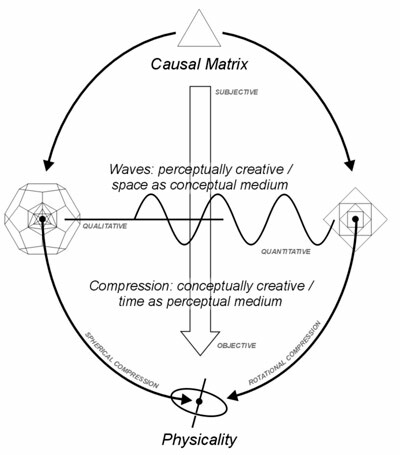 The influence of the Causal Matrix on the objectifying universal medium expands the Maxwellian concept of waves (Waser, 2000) to include the objective and subjective faculties and the implied phases between them. As the reciprocation of physical media and principles was explained in the context of the individual matrix (microcosm), this naturally implies the unification of the long range forces in a single wave. This universal approach is referred to as matrix wave. A special implication is, that there may hence exist a singular wave solution for natural entities. This is akin to a quantum wave equation for larger objects, however with the specialty that the complexity is not solved through objectivation of probabilities, but through harmonic resonance among well identified perceptual and conceptual media. In other words, entities that take part in the natural hierarchy of life could essentially be represented by a single wave, which is naturally harmonically embedded within greater, and composed of smaller waves. Research on matrix waves can yield new insights and opportunities in fields like for example healing (from cells to ecosystems), material sciences (crystals), astrophysics (galaxy- and star formation, solar physics), or energy supply (control and utilisation of secondary reduction phase). Clearly, in all cases the classical objective, and verily materialistic approach, is replaced by a subtle appreciation of the causal bearing of all entities and processes. With respect to microvita cosmology, the concept of matrix wave is virtually exchangeable with an inferential wave carrying microvita. An inclusive creation philosophy is almost per definition self-referral, but not necessarily because of that unshareable. Not its strictly academic valour, but its practical applicability determines its usefulness. P.R. Sarkar’s microvita theory is a new line of thought which like any other discipline should, and can be dealt with in a scientific manner, but considering its unique nature, origin and scope, should not be reframed within the general scientific debate as it clearly transcends current methodological empiricism. Hence, MVC / WMP is not developed in a line of creation philosophies, but to propose a radically new and practical creational paradigm. Microvita cosmology, extended with wave matrix physics was thus introduced as a new, scientific approach combining an evolved concept of universal subjective faculties with concrete physical and physics implications. Besides several breakthrough philosophical consequences of the former part, it is the latter part which can bring about an altogether new field of practical applicability. It was demonstrated through the interpretation of the universal subjective faculties, that creation not only includes a cognitive, but also a synergetic or empathic side. Consequently, universal subjectivity was shown to be a structural part of creation. The sensitive researcher will be aware that this ascribes an intrinsic esthetical and potentially devotional quality to the theory. If this sensitivity is evolved into actual intuitional skills, the intrinsic logic and necessity of these aspects are sure to be realized. Only this can help overcome objective bias and lead to meaningful evaluation and disclosure. In physics terms, obvious focal points include a deep understanding of the wave matrix singularities and developing unambiguous definitions of the universal subjective and objective faculties. The progressive reciprocation of physical media and principles was discussed in concept, so that objectively and subjectively qualified researchers may find further clues for unification and practical utilisation. Especially the angular discipline among the matrix singularities in the central sphere of geodesic compression should be studied, as it can provide new insights in the role of physics in bio-psychology and generally the practical application of MVC / WMP, respectively matrix waves in a wide range of fields. MVC / WMP describes a universe in which life is not a lucky accident, but a necessary and inalienable part of creation. This innate sentiency, which is the cause and bearing of the universe’s very existence and beauty, must not only be matched, but verily be equalled by a civilisation which is to maximum utilise it for universal existence, progress and welfare. Evolution is a one-way ticket, so this is not an option, it is a supreme directive. Therefore, microvita theory is not given to seize the day - it is to seize the future. P.R. Sarkar (1986). “Microvitum - the Mysterious Emanation of Cosmic Factor”. Lecture, Calcutta. Microvita in a Nutshell (collection of lectures). Ananda Marga Publications, 3rd edition Aug. 1991 (hereafter referred to as MViaN). Cakra (1st. chapter). Ananda Marga Publications, 2nd edition 1996 (hereafter referred to as “A. Sutram”). Shrii Shrii Ánandamúrti (1961-2). Tantric Theory of Creation (4th. chapter). A. Sutram. Publications, Revised 2nd edition, 1987. P.R. Sarkar (1989-1). “Microvita and cosmology”. Lecture, Calcutta, MViaN. P.R. Sarkar (1987-2). “Questions and Ansers on Microvita”. Lecture, Calcutta, MViaN. P.R. Sarkar (1989-2). “Plexii and microvita”. Lecture, 1989, Calcutta, MViaN. Waser, André (2000). Maxwells field equations. Notations. AW-Verlag. Gibson, Kevin (2011). The Nature of the Dirac Equation. Arizona State University. DNA are fractal and fine-tuned by the Golden Ratio 1.618. Interdisciplinary Sciences: Computational Life Sciences, Volume 2, Number 3.